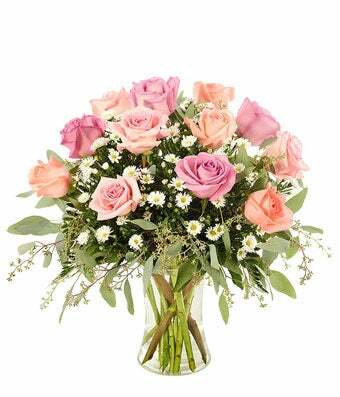 Send your sweet love this bouquet full of pastel roses to bring a smile to her face. This unique bouquet features long-stemmed pink roses, peach roses and purple roses. All the pastel roses are paired with white monte casino and eucalyptus. If you are looking for a bouquet that is a classic look, but updated color scheme this is a perfect choice this Valentine's Day.